President Barack Obama today reversed plans to withdraw about 5,000 U.S. troops from Afghanistan this year, keeping the current level of 9,800 troops until end of 2015. 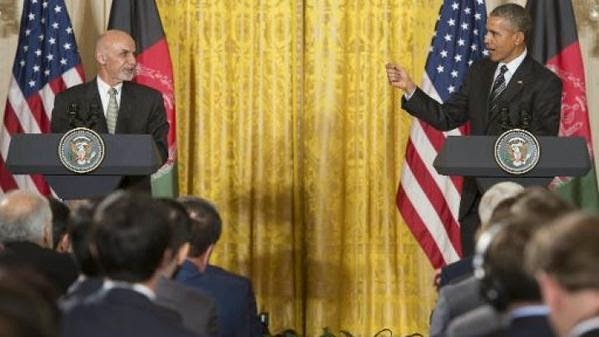 Obama announced the decision after meeting with visiting Afghan President Ashraf Ghani at the White House. Earlier in the day, Afghan President Ghani and Chief Executive Officer (Prime Minister) Abdullah Abdullah visited the Arlington Cemetery to honor more than 2,200 U.S. servicemen and servicewomen killed in action while fighting the Taliban and Al Qaeda in Afghanistan. In a moving ceremony, they placed wreaths to honor the fallen American soldiers.